WASHINGTON – House leaders added employer checks and an expanded farmworker visa program in their latest attempt to get an immigration bill that can pass, but most lawmakers leaving a GOP meeting Tuesday morning appeared skeptical of its chances. That’s about as optimistic as it got after House Speaker Paul Ryan gathered his caucus behind closed doors in hopes of hammering out a compromise on the stalled immigration package, which could come up for a vote as early as Wednesday. The latest effort to pass a bill comes less than a week after conservative Republicans joined Democrats to kill one GOP-backed plan, leading President Donald Trump to urge lawmakers to stop “wasting their time” on immigration reform until after the election. Last week’s bill and the current version both include the “four pillars” Trump has said must be in any immigration reform bill: stiffened border security, a reduction in family migration, elimination of the visa lottery and a pathway to citizenship for beneficiaries of the Deferred Action for Childhood Arrival program. That program deferred deportation for those so-called Dreamers, immigrants who were brought to this country illegally as children. But conservatives in the House, like Gosar, have balked at a path to citizenship for Dreamers, which they said would reward their illegal entry into the country. The latest version of the bill attempts to sweeten the pot with a new class of farmworker visa, dubbed H2-C, that would let agricultural workers stay in the U.S. for up to three years on one visa. Amendments proposed Tuesday called for as many as 450,000 of those visas. The bill would also require that all employers in the U.S. use the E-Verify system to certify the citizenship of anyone they hire. E-Verify is a Department of Homeland Security database of people legally allowed to work in the U.S. 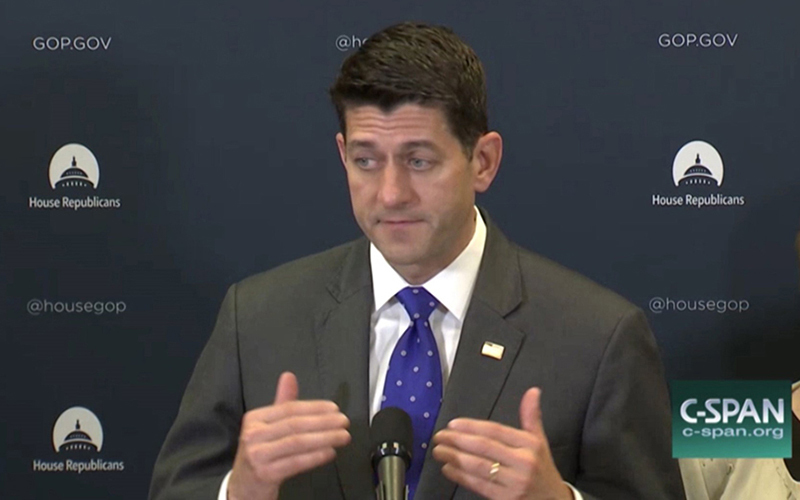 Even with the new additions to the legislation, however, Ryan did not sound confident Tuesday about the bill’s fate. Ryan downplayed the president’s call to give up on immigration reform for now. Before it can get to the Senate, however, the bill needs to pass the House. Democrats are dead-set against the Republican-backed measures. And the latest amendments may not be enough to placate GOP lawmakers and their concerns over the bill’s protections for Dreamers. Arizona Rep. Debbie Lesko, R-Peoria, voted for the bill that failed last week, which was considered tougher than the current measure. She said after Tuesday’s caucus meeting that while she approved of the E-Verify amendment, she is still not sure how she will vote when the bill comes to the floor. “I’m having some heartburn over the compromise bill because it gives a pathway to parents for citizenship,” Lesko said. She said she would “have to see if there’s any changes made” before committing to the bill.